Few Major League Baseball teams have a history as glorious and as interesting as the Cincinnati Reds. From the earliest days of baseball’s first professional team, skillful and colorful players have worn the Cincinnati uniform. 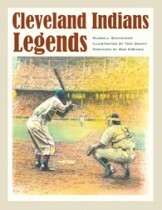 The greatest and most famous of these players have attained legendary status, and in this book they are given their due. Best-selling baseball author Mike Shannon brings to bear his expertise on the Reds in selecting and profiling the forty Reds who best fit the definition of “legend.” From the Wright Brothers and Edd Roush to Johnny Vander Meer and Ted Kluszewski, from Frank Robinson and Pete Rose to Barry Larkin and Joey Votto—athletes who by their stellar play, unique personalities, and uncommon achievements have made themselves unforgettable—they are all here in Cincinnati Reds Legends. Shannon encapsulates the greatness of each player in deft vignettes that are remarkable as much for their insight as their interest. 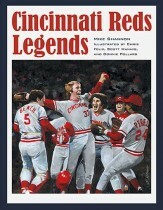 Even veteran Reds fans will get to know and appreciate these legends better through the book’s lively and informative text. What truly sets this book apart is the stunning original artwork that supplements the text. 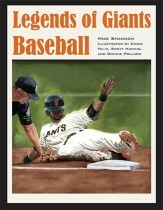 Three of today’s most gifted baseball artists provide full-color, full-page images of the forty Legends that are invariably beautiful, arresting, and joyful to behold. Chris Felix’s exquisitely executed portraits have the dignified look and feel of an old master, capturing the essence of his subjects. With rigorous attention to detail, an ebullient palette, and his unerring sense of composition, Scott Hannig dramatizes a lifelong devotion to the Reds. The digitally created showstoppers of the brilliant Donnie Pollard simply mesmerize the eye. Here are the Reds’ greatest players as they have never before been presented. The talented trio of Felix, Hannig, and Pollard is a diamond act that no self-respecting baseball fan can afford to miss. Miniature portraits, playing statistics, and stunning paintings of Palace of the Fans, Crosley Field, Riverfront Stadium, and Great American Ball Park round out this beautiful book that will be treasured by baseball fans everywhere. AuthorMike Shannon is the author of more than 20 baseball books and the editor and publisher of Spitball: The Literary Baseball Magazine. He has written a monthly column for Reds Report for more than 20 years. Cincinnati artist Chris Felix has produced baseball paintings for the Topps Baseball Card Company and “24 at 75,” the national art show devoted to Willie Mays. Miamisburg, Ohio, artist Scott Hannig invented Pastimes baseball scoreboard clocks and illustrated the graphic novel Hutch: Baseball’s Fred Hutchinson and a Legacy of Courage. Donnie Pollard is the Creative Art Manager–Hot Markets for Adidas in Indianapolis, Indiana, and the Director of Graphics for Spitball magazine.